Champion of the Thames RC will be running Champs Eights Head on Sunday 19th May 2019 with racing on a 1450m course upstream from the Plough to the site of the former Penny Ferry pub. Divisions will be run, each with a maximum entry of 40 boats. Your chosen division will be secured once payment has been received for your entry. Entries are open and will close at 6pm on Wednesday 15th May 2019 or when the divisions are full – whichever is sooner. Full details for payment is given on completion of your entry via the form linked above. Entries will be charged at £64/boat if payment is received before 6pm on Wednesday 15th May and £72/boat if payment is received after the deadline up until racing begins. No crews will be allowed to race without payment having been made. College crews, please note that your category is the division in which your boat will start in this year’s May bumps (e.g. Darwin women’s first boat will race in the W2 category). Any crews that will be entering the Getting-on Race are welcome to enter as M5 or W4. Club A – average more than 2 BR or CRA event wins in last 24 months (head race or regatta) who are below Championship level. Novice – Maximum of 2 members of the crew have won a BR or CRA event (head race or regatta) before 1st January 2018. Will be found at RowClock after each division is complete and announced at the prize giving at 16:30 at Clare Boat House. Final results will be posted on this website in the days after the event. 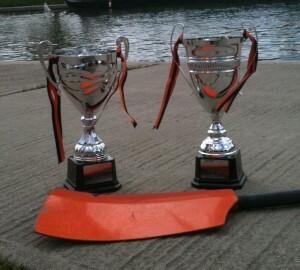 Champion of the Thames RC would like to thank Milton Brewery for their support of this event. Each year we aim to run this event on the 3rd Sunday in May. Future dates are to be approved by Cambridgeshire Rowing Association. Detailed information on the event and its management can be found in the documents linked at the bottom of this page.